Heat oven to 350°F. 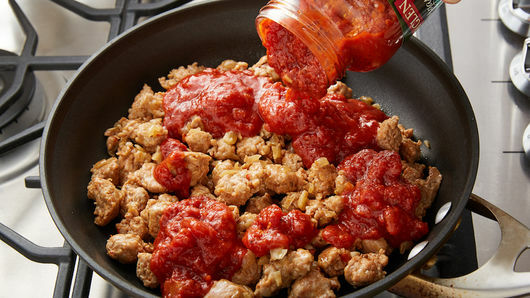 In 10-inch nonstick skillet, cook sausage, onion and garlic over medium-high heat 5 to 7 minutes, stirring occasionally, until no longer pink; drain. Stir in pasta sauce. In ungreased 13x9-inch (3-quart) baking dish, spread 1 cup of the sausage mixture. Arrange half of the ravioli on top; sprinkle with 1 cup of the Italian cheese. Top with remaining ravioli, sausage mixture and remaining 1 1/2 cups cheese. To Freeze Baked Casserole: Cover baked casserole with foil, then in double layer of plastic wrap; label and freeze up to 3 months. To thaw and bake, thaw in refrigerator overnight or until completely thawed. Remove plastic wrap; leave foil cover on. Bake 50 to 65 minutes at 350°F until center is hot (165°F). Sprinkle with chopped fresh basil. Serve with your favorite garlic toast. Ever wonder: what exactly is ravioli? Is it pasta? Is it a dumpling? The answer is…both! The technical definition of “dumpling” is a cooked mass of dough with some sort of filling. Ravioli is a type of dumpling, with its filling sealed between two thin layers of pasta dough. Ravioli, as you may already know, is Italian, but the broader category of “dumpling” reaches far and wide—there are wontons in China, sweet and savory pierogis in Eastern Europe and chicken and dumplings in America. Though ravioli originated in Italy, it has become a household favorite in the United States, too. 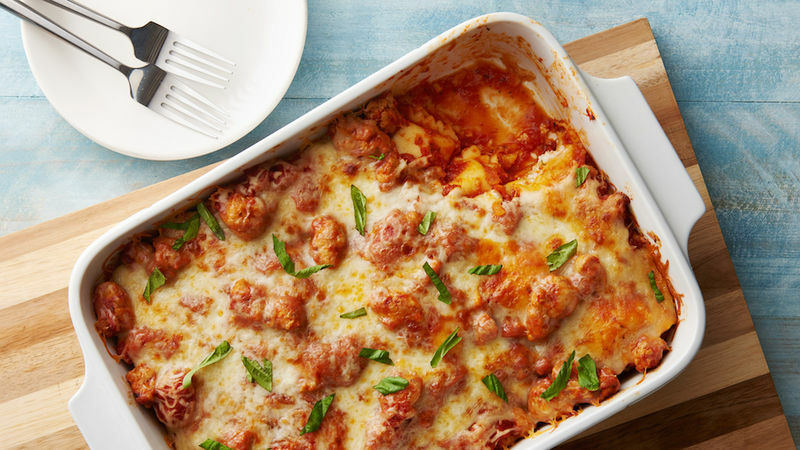 Recipes like this Italian Sausage and Ravioli Casserole take the filled pasta to the next level by layering it with sauce, sausage and cheese. 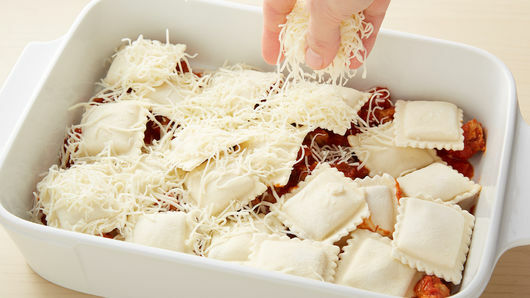 There are many more that put a creative spin on ravioli, and you don’t want to miss out! Try any one of our delicious takes on ravioli ASAP.